Hi – this Fredy checking in again from the Ecuador High Altitude Trip. 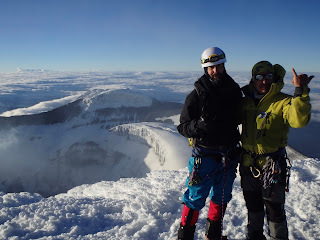 Today we climbed Cotopaxi, the highest active volcano in the world (19,348 ft)! We summited after an excellent climb – everyone did a great job! To take advantage of frozen conditions in the snowpack for easy cramponing, we got up a little before midnight, ate and finished organizing our gear, and then began our climb by 1 am – right on time for our planned schedule. As we had hoped, the snow conditions were excellent – we enjoyed very secure footing, and we had very comfortable and enjoyable climbing. All of our team climbed very strongly and were very motivated, and we reached the summit in good time, at approximately 6:20am. The weather totally cooperated, and we had a fantastic view from the top of all the other volcanoes and the spectacular Cotopaxi crater! All around it was a fantastic climb. Now three of our climbers are heading home, and we are sorry to see them go, but glad to have shared such a successful trip! Now, the other three climbers, myself and another guide are heading to climb the highest peak in the country: Chimborazo! We will get back in touch after the climb. Wish us luck!